Successfully Added Wireless Headphone and Receiver with MIC to your Shopping Cart. Hurry and get your samples in! 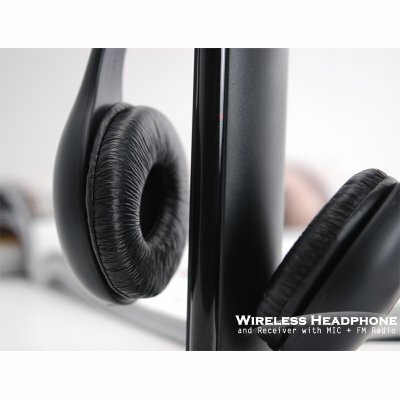 The CVPT-G207 Wireless Headphone and Receiver with MIC are in stock now and available at no M.O.Q. for a limited time only. This wireless headphone with FM radio and MIC is brought to you by Chinavasion at a superb factory direct wholesale price. Click "Add to Cart" and let us express ship you a sample to see for yourself the amazing quality you get for such a sweet deal. Note: This great new product is with factory direct low china wholesale price and we'll even dropship it to your customer. You get some nice sounding earphones that are comfortable and you can listen to FM radio. The transmitter is basically an FM station that the headphones pick up, no static, long range. The switches are of normal quality for this price range, $6. Takes a bit to find the computer on the dial, but once you do it's crystal clear. i do not under stand ((This great new product is available as a no M.O.Q. (no minimum order quantity) item for a limited 60-day run. After that it will be a 4 MOQ item. So get your sample orders in now to experience this great product for yourself! [Chinavasion Editor: Dear Ahmed, this means that after 2 months have passed from the initail launch of this product, it will then only be available to purchase at a 4 MOQ].